Borrowed from Latin lār (“ancestral deity or spirit”) from Etruscan. (Roman mythology, chiefly in the plural) singular of lares: a household god, particularly overseeing the family itself. Would the great emperor’s lar, free of its soldierly body rheumatic from German mists and browned and grizzled by the Indus sun, haunt that pinedark road to Elefsis to taste again the essences on which it fed and gather with voluptuous fingers the ghosts of roses? The gibbon is pluralized as lars. The Latin household gods usually appear as the plurale tantum Lares, following its Latin plural form and capitalized to denote a particular group of lares; the alternative forms Lars, lares, and lars sometimes appear. ^ Vladimir Orel, Albanian Etymological Dictionary (Leiden: Brill, 1998), 213–4. From Latin larem (“guardian spirit; home”), from Etruscan. “lar” in Dicionario de Dicionarios do galego medieval, SLI - ILGA 2006-2012. “lar” in Dicionario de Dicionarios da lingua galega, SLI - ILGA 2006-2013. “lar” in Tesouro informatizado da lingua galega. Santiago: ILG. “lar” in Álvarez, Rosario (coord. ): Tesouro do léxico patrimonial galego e portugués, Santiago de Compostela: Instituto da Lingua Galega. Probably from Etruscan 𐌋𐌀𐌓 (lar), 𐌋𐌀𐌓𐌔 (lars), or 𐌋𐌀𐌓𐌈 (larθ, “lord”), though it could possibly be from Proto-Indo-European *las- (“eager”), cognate with lascivus. From Proto-Germanic *laizō, from *laizijaną (“to teach”). Cognate with Old Saxon lēra, Dutch leer, Old High German lēra (German Lehre). From Latin larem (“guardian spirit”), from Etruscan 𐌋𐌀𐌓 (lar), 𐌋𐌀𐌓𐌔 (lars), or 𐌋𐌀𐌓𐌈 (larth, “lord”). From Latin lār, lārem, in its current form most likely a learned borrowing. 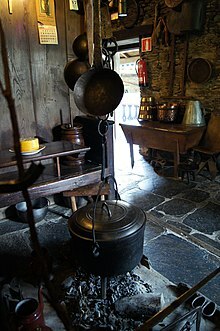 A popular or inherited form also existed, referring to the irons in a hearth on which vats were hung to heat water or make stews. The word may ultimately be of Etruscan origin. From Old Norse lárr, cognate with Finnish laari, Russian ларь (larʹ), of unknown origin. Doublet of laar. From Old Norse lár, from Proto-Germanic *lahwaz.